C-Lon beading thread and cord are loved by crafters and beaders alike because of its high-quality, versatility and affordability. The vast array of rich and vibrant colors make it easy to find the right shade for every design. Our C-Lon products are available exclusively through Caravan Beads and made right here in the USA. Available in six different weights it is easy to find the perfect thread or cord for any project. C-Lon thread comes in two sizes (AA) and (D), both are a monofilament nylon thread that is slightly flat. Similar to the Nymo beading thread that most of us learned to bead with, this modern version is slightly stronger and comes in a beautiful rainbow of 36 colors. C-Lon Thread is packaged as a single bobbin or a tube of 12 bobbins. C-Lon AA Thread is perfect for bead weaving projects that call for multiple passes through seed beads. If your design uses size 15/0 seed beads or Small Delicas (DBS) the size AA thread is the best choice. C-Lon AA thread works well with our finest gauge beading needles. Bobbin measures 1/4" x 3/4"
Purchase a bobbin, or a tube of 12 bobbins. Will fit through size 15/0 seed beads or larger. C-Lon Size D Thread is ideal for most bead weaving projects. Size D is slightly thicker than the AA and passes through both seed beads and larger beads with ease. It's the perfect size thread for stitching beads into your leather wrap bracelets, for brick or peyote stitch, and almost every other stitch you can think of. Use this sturdy thread when hand or loom weaving. Bobbin measures 1/2" x 1"
C-Lon Cord comes in four sizes: CLMC, CLC.135, CLC, and CLC.400. All four weights of C-Lon Cord are made of plied and bonded nylon that has been twisted for added strength. Its natural sheen makes for bright pieces that will last. Nylon is a synthetic material and is easily washed in cold water with zero color fade or shrinkage. C-Lon Cord can be sealed with a thread burner for a clean finish that prevents unraveling. Its strength and wide range of colors make C-Lon ideal for kumihimo, micro-macrame, stringing, knotting, braiding, bead crochet, and loom weaving. 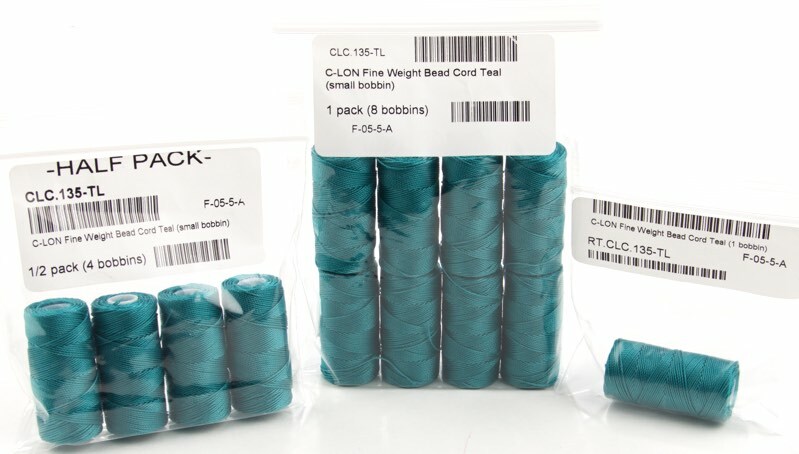 C-Lon Cord is packaged as a single bobbin, a half-pack of 4 bobbins, or a box of 8 bobbins. C-Lon Micro Cord (CLMC) is the most versatile of our cords. Micro Cord is thin enough for weaving and strong enough for stringing. When working with Miyuki seed and shaped beads Micro Cord is ideal for spiral, peyote, brick stitch, and netting. It also works well in kumihimo, leather wrap bracelets and loom weaving. Bobbin measures .75" x 1.625"
Approximately 100 yards (91m) per bobbin. Purchase a bobbin, a half-pack of 4 bobbins, or a pack of 8 bobbins. Will fit through size 11/0 seed beads or larger. C-Lon Fine Weight Bead Cord is the newest size of C-Lon. It is slightly thicker than the Micro Cord making it perfect for kumihimo with size 11/0 beads, Swarovski pearls, and Miyuki Long Drop Beads (LDP). Choose from the wide range of hues and create a colorful multi-strand necklace. CLC.135 is also ideal for delicate braiding and micro-macrame and is the perfect size for tubular bead crochet. Approximately 50 yards (45m) per bobbin. C-Lon Bead Cord (CLC) is our most popular bead cord because it is great for so many different projects. This regular weight C-Lon Cord is ideal for kumihimo using size 8/0 seed beads or shaped beads like Miyuki Square Beads (SB) or Long Magatams (LMA). CLC is also ideal for stringing, knotting, macrame and bead crochet. If you’re looking for an all-around crafting cord the CLC offers both strength and our largest selection of beautiful colors. Bobbin measures 1.25" x 1.625"
Approximately 92 yards (84m) per bobbin. Purchase a bobbin, a half-pack of 4 bobbins, or a box of 8 bobbins. Will fit through size 8/0 seed beads or larger. C-Lon Heavy Weight Bead Cord (CLC.400) works well as a colorful base for knotting and braiding. Perfect for stringing size 6/0 seed beads or larger, CLC.400 is a good choice for macrame and can also be used in Kumihimo projects. CLC.400 is a great crafting staple as it’s easy to use for both children and adults. Try using the CLC.400 for your projects where you really want the cord to take center stage. Will fit through size 6/0 seed beads or larger.